Netflix’s hostile relationship with U.S. theater chains has sunk to a new low. The streaming website has decided to release its original movie Crouching Tiger, Hidden Dragon: Sword Of Destiny online on the same day as it was due to hit theaters. But, in an attempt to preserve the theater-going experience and the magic of watching a film on the big screen, America’s largest theater chains have thwarted this simultaneous release, vowing not to screen the film, which will now only play in around a dozen IMAX theaters in the U.S. According to the LA Times, Netflix believes that releasing films online and in cinemas on the same day is the inevitable path for the future of films, as customers and viewers want to be able to watch releases on any platform at any time they desire. For obvious reasons, theater chains have a huge problem with this, as they insist that this completely cripples their own business. We will not participate in an experiment where you can see the same product on screens varying from three stories to 3 [inches] wide on a smart phone. We believe the choice for enjoying a magnificent movie is clear. Regal was soon backed by other cinema and theater chains, most of whom vowed to not screen Crouching Tiger, Hidden Dragon: Sword Of Destiny, as they insisted that there should always be around 90 days between a film’s theatrical and home entertainment release. This will be a huge blow to Crouching Tiger 2’s U.S. box office return though, which is expected to fall way short of the $128 million that the 2000 original made in the US. 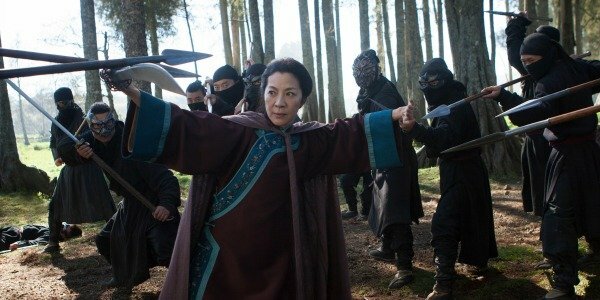 Crouching Tiger, Hidden Dragon ultimately went on to gross $213.5 million around the world back in 2000, and Netflix is hopeful that the sequel will be able to overcome its lack of a proper U.S. release by appealing to an international audience. It opened in China last week to $21 million. The rise of Netflix and Amazon Prime as film distributors clearly has theater chains worried. These streaming websites showed their rising prominence when they splashed the cash at the Sundance Film Festival earlier this year, purchasing several films, including the acclaimed Manchester By The Sea and Woody Allen’s upcoming new film, from under the noses of studios. Somewhere down this line, this debate between movie theaters and streaming services will have to be settled, but that day is not today.